I am not a girl that gets up every day and curls my hair and puts on my makeup. I am definitely a yoga pants around the house kind of girl. I always have been. I may have even worn pajamas to class one day in college. Or two days. But after my son was born I wanted to make sure that I didn't go to extremes, so I promised myself that I would at least take a shower every day. Moms of newborns know that sometimes that is asking a lot. But on some days, the shower is all that kept me sane. The few minutes alone in the shower gave me the feeling of a fresh start, even if it was 9 o'clock at night. 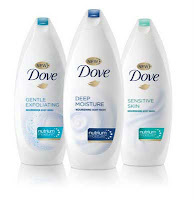 When Dove asked me to give Dove Nutrium Moisture Body Wash a try and wanted to know how I nourish my body and soul on a daily basis, that was the first story I thought of. Three kids and 10 years later I can count on one hand the number of days I haven't taken a shower. I even took a shower in Park City, UT when the water heater in our vacation house went out and it was freezing cold. Still took a shower. It is sort of my sanity saver. Maybe not that Park City shower, but the rest of them. What isn't to love? Time alone, the sound of water blocking out the other noises, steam, and good smelling soap. I try to make time to meditate. It doesn't have to be for very long. Just long enough to center myself and get back at with a good attitude! I try to think thankful thoughts! Being positive really does help get me through rough times. Finding time to create also does wonders for me. And lastly, when all else fails and I have tried to relax and nothing is relieving the stress, throwing a thrift store piece of bricabrac against the back fence really helps! One good crash and it just makes you laugh! Being creative keeps me centered. Even if it's just a quick sketch of a project or reorganizing a small space. This keeps me in a positive frame of mind! To take time for myself I like to make cards. I love how making something and seeing how it turns out. I also love seeing how others react when they get a homemade card. I like to read and give myself a pedicure. I dont' know if it's a "secret", but I try to make the most of my commute into work. Some days it can be as long as an hour but at least 30 minutes. And even though I may get annoyed at all the traffic and the stupid drivers, I try to make the most of it by clearing my mind of everything except my driving duties, or getting some quiet time to focus on my projects for the day. I shower every day as well. I love my Dove body bar, but may need to try out the Dove Nutrium Moisture Body Wash. Dry skin in the winter is the worst feeling. Makes clothes clingy as well. i nourish myself with a soak in a bubblebath! I listen to music. It's the best therapy. I lock my door to my sewing room and work on something for myself! I am a bath girl! Taking a bubble bath with soft music on after the girl child is asleep is something I look forward to after a hard day. I would love to have a few moments for myself, I do like to read a book but don't find the time alone, thanks for the giveaway, sounds great! I read to relax. And drink tea. I play with my kids and have some time in with them; it makes me feel better to know that I am more than the maid. I also try to get outside every day, even if it's just a walk to the mailbox and back. I try to nourish myself by doing something small for myself every day. Whether it is lighting a scented candle, making a cup of coffee exactly the way I like it, crafting something, or reading for 10 minutes, just taking a few minutes for just ME helps tremendously. I nourish myself every day with getting fresh air, eating an organic salad in the afternoon (the rest of the day is a crap shoot! ), grabbing a bath a couple of times a week and doing Yoga! I love Nourishment! I also love Dove products! Pretty much ditto to everything you said. I always get a shower if nothing else! I love Dove products! Thanks for a chance to win some. I try to get out to the garden and get my hands dirty! Nothing like relaxing with the good earth and watching the beauty God has created. Put in a jacuzzi tub in the kids bath, try to use it, not enough though! I sit and quietly enjoy a cup of coffee each morning before anyone else is awake! Love reading all these ways to nourish - I need to try some. For now, coffee in the quiet time of morning is mine! Thanks for this giveaway and Merry Christmas to you and yours! I like to read, take long baths and drink coffee! I have eczema so Dove products have always been something I used that didn't irritate my skin. These products look great! The best way to nourish myself is to do something I have total control over and that is only eating foods that are good for my body. Since I made the switch and only eat healthy foods, my hair and nails have thickened, my skins looks and feels better, and I have twice the energy I used too! Sanity saver here is DEFINITELY a long hot bath!! I make sure to do things for myself. That could be going out with friends, watching a movie, etc. Baths with music and bubbles use to be one of my favorite things to do for myself but haven't been able to do it while I've been in school. I try to walk everyday and listening to music helps as well. Reading and long baths are my sanity savers! My nourishment and sanity-saver is heading across the street to the beach, even if only for 10 or 15 minutes. Drinking a hot beverage, of any sort, hot chocolate, tea coffee, whatever, is always sort of meditative to me. Definately a way to nourish myself spiritually... and if it's tea, the nutritionally too. Start everyday with a shower and my Dove products. Thank god for Dove. i jump in the bath!